Youth for SDGs Scholarship – Applications open! 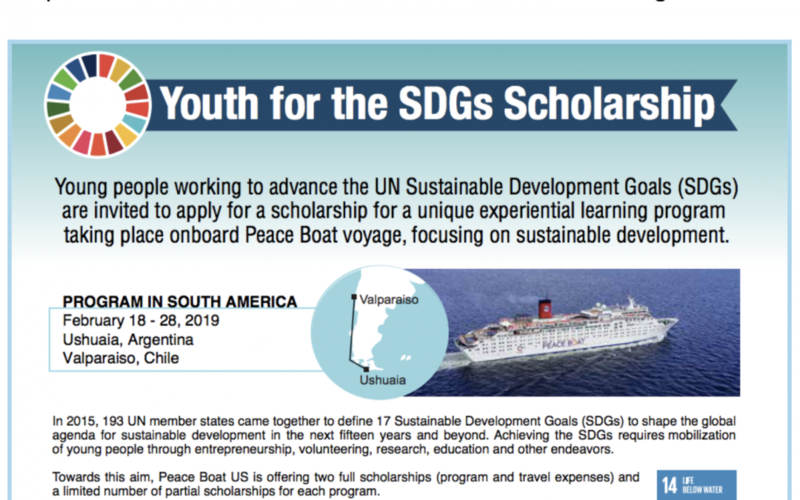 Young people working to advance the UN Sustainable Development Goals (SDGs) are invited to apply for a scholarship for a unique experiential learning program taking place onboard Peace Boat voyage, focusing on sustainable development. In 2015, 193 UN member states came together to define 17 Sustainable Development Goals (SDGs) to shape the global agenda for sustainable development in the next fifteen years and beyond. Achieving the SDGs requires mobilization of young people through entrepreneurship, volunteering, research, education and other endeavors.